Reimagine Play is inspiring the next fit generation through fun, obstacle based fitness and active play programs and events for kids and families. Join our Movement to #InspireAFitGeneration. Our signature On the MOVE class is a fun, obstacle-based fitness class for kids ages 5-13 of all levels. We pop-up classes throughout greater Boston and bring the course right to you, indoors and outdoors. We partner with camps, schools, youth groups and community health centers to run functional fitness and active play programs that offer an alternative to traditional organized sports. We work with parks, event planners, race organizers and fairs to organize fitness experiences for families. 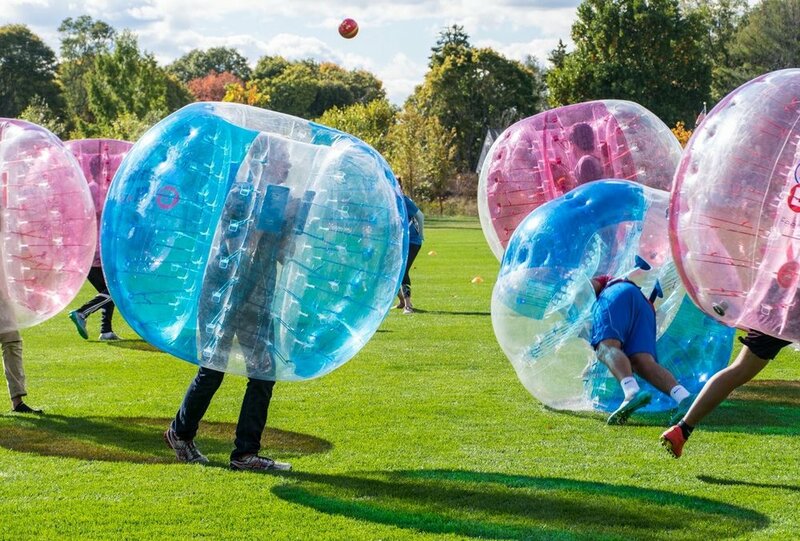 We help you create an exciting activities that enhance your event - from bubble ball soccer to ninja warrior style obstacle races. Wondering why play is a fundamental building block for learning? Keep reading to learn why play is important, how it can benefit your child, the different types of play your child needs, and how you can ensure your child gets all the play time they need. We know all too well the CDC recommendations for limiting screen time for children. While we want kids to be more physically active, new research suggests that some video games may have positive health results. As we begin 2018, there's no better time to get up to speed on this year's fitness trends. With families focused on increasing physical activity, we scoured opinions from fitness and health industry experts to see what they consider hot in youth fitness in 2018. Check out the list to see if your kids' health and fitness faves made the cut. Our growing adventure streak led us on a quest for toys that will get kids outside to play and challenge them to be active. This year's picks will inspire even the most avid video gamers to get off the couch. We included a mix of indoor and outdoor toys. These will help your kids hone their climbing, jumping, balance, agility and throwing skills while burning some energy. These picks are ideal for multiple age groups and may even encourage the whole family to get active. Welcome Back to School and to the lovely Fall weather. Reimagine Play had such a busy summer that we thought to share all we have been up to and what’s next. It's the middle of summer and finding ideas to keep the kids entertained may be harder by the day. If you don't want your children to spend their summer glued to the TV or their gadgets, try these active play ideas to get the family outside! Sign up with your email address to receive Reimagine Play news and updates.